Send your love gorgeous blooms with the Bundled in Love Bouquet. 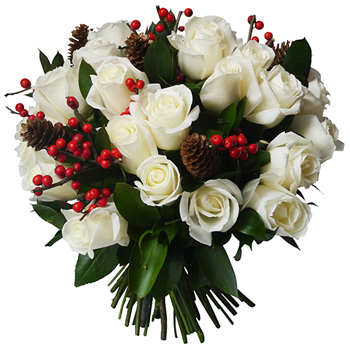 This stunning arrangement contains a grand total of 21 white Roses, pinecones, sprays of Hypericum Berries, and an abundance of seasonal foliage. The Bundled in Love Bouquet is ideal for wintery dates or makes a striking wedding bouquet.